Browse all Croatia villas here to give you a taste of what Croatia has to offer and what sort of Croatia holiday you might like to have... We'd recommend you give us a call and we'll suggest some areas and Croatia villas for you to have a look at! We spend a great deal of time in Croatia, traveling around, spending time in all the areas, and we know the lay of the land, so we can compare all the villa locations and tell you our favourite spots. Give us a call so we can point you in the right direction! This charming villa has one of the best locations in sought after Mlini Bay, sitting just one house behind the sea edge in the centre of the sweeping bay. Dubrovnik is one of the most sought after destinations for a villa in Croatia. It is, of course, well known for the beautiful and romantic UNESCO World Heritage Site, Dubrovnik Old Town and often called the ‘Pearl of the Adriatic’ because of it. This ancient walled town is wonderful to explore – walk the city walls and turn in and out of little lamp-lit streets, have coffee in one of its pretty piazzas or dinner in an intimate little side street. There’s always something going on in the old town but it is busy. The best places for Croatia villas in Dubrovnik are the little towns of Mlini Bay, Cavtat Bay and Zaton Bay – not far from the old town of Dubrovnik and everything else on the Dubrovnik Riviera, they are a really good base for exploring the coast. Mlini Bay has lovely beaches and a nice selection of restaurants, it’s easy to stay here all day and evening but why not hop on a water taxi to Dubrovnik Old Town or out to one of Dubrovnik’s little islands where you will fine beautiful little coves and places to swim! Of course, there are many other places to stay in a villa in Croatia and the Split Riviera is similar in many ways – it also has the famous old towns of Split and Trogir plus little bays and beaches all the way up the coast. Then the Croatian Islands of Korcula, Brac and Hvar are easily accessible by ferry so you can island hop across in no time at all and really escape. There are some gorgeous off the beaten track island getaways on Brac and Hvar Island villas with wonderful scenery by the sea and in quaint little towns on Korcula Island. There are plenty of lovely little spots on the islands to delight you. Charming little bays and towns on the sea just to relax in. There are high end villas and cozy old town bolt-holes plus fabulous beach locations for the best family holiday in Croatia.While Hvar Island has become more well known recently due to its celebrity visitors to Hvar Town and nightlife, Brac Island and Korcula Island are more down to earth islands, as they always were, and are stunning alternatives that you shouldn’t overlook in our opinion. 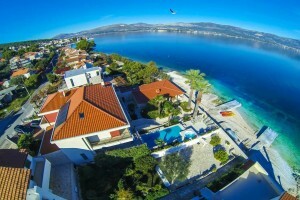 There are some super Croatia villas on Brac Island and Korcula Island, perfect for family holidays or extended family trips, or couples.